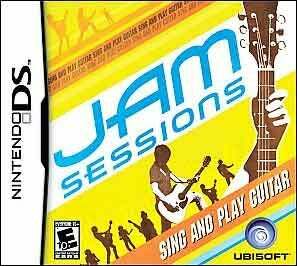 You can't play Guitar Hero on your Nintendo DSi, but you can still be one, as Ubisoft announces Jam Sessions 2, the sequel to the game that turns your DS into a guitar. We saw great things from the original Jam Sessions, including a Frag Doll singing Portal's "Still Alive" while strumming away, so we expect even bigger things from the sequel, and developer Plato hopes to deliver. The sequel helps players learn the guitar by playing through various songs, or convert their own creations into playable levels. "Ubisoft is pleased to present players of all ages with a music game that builds on the unique foundation of the first title," said Tony Key, senior vice president of sales and marketing at Ubisoft. "In Jam Sessions 2, players can freestyle sections of featured songs and make them their own. With a push of a button, players' created works can be included in the game play and instantly converted into a playable level." Look for Jam Sessions 2 to strum its way onto store shelves sometime this fall.